Since the 1920s there have been three major gold rallies (1930s, 1970s and the current rally). All three major gold rallies came after a significant top in the Dow and the Dow/Gold ratio (1929, 1966 and 1999). A great portion of the 1930s and 1970s rallies occurred when the Dow was falling significantly. In fact, the biggest rise in the gold price occurred when the Dow was falling or was trading closer to the bottom of its trading range during that period. The current gold rally (since 2001) has mostly been during the time when the Dow has also been rising, with the exception of a short period in both 2002 and the end of 2008 to Feb 2009. The best of the current gold rally, since 2001, has been during a time when the Dow was rising as well. With the Dow still relatively close to all-time highs; I believe the current gold rally has not yet had its best period – it is still to come, and will be during the time that the Dow is falling just like in the 1930s and 1970s. 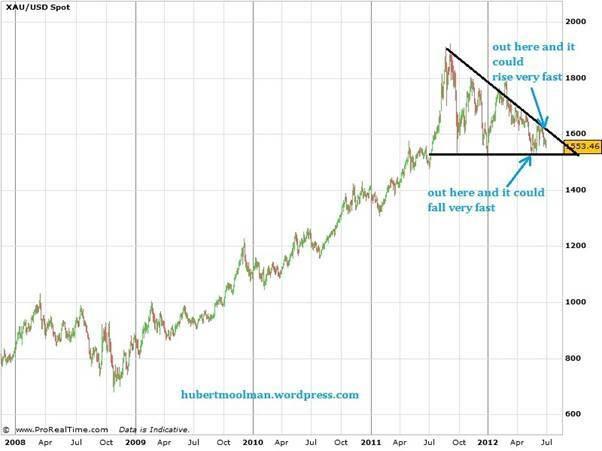 It is my believe that if gold goes on to rally from here, then we will have financial turmoil like there has never been. The word depression might not be adequate to describe what is coming. The Great Tribulation might be the proper term. More details on this in my next updates. On the chart I have indicated a trading channel in which the ratio has been moving for the last four months. On Thursday, 28 June, it hit the top of that channel and was smacked down immediately. When price goes out of this channel, it could be a sign of where this ratio, as well as the gold and silver price is going. More importantly, there is a bearish divergence, between the ratio and the RSI. The RSI has been making lower highs, whereas the ratio has been making higher highs. 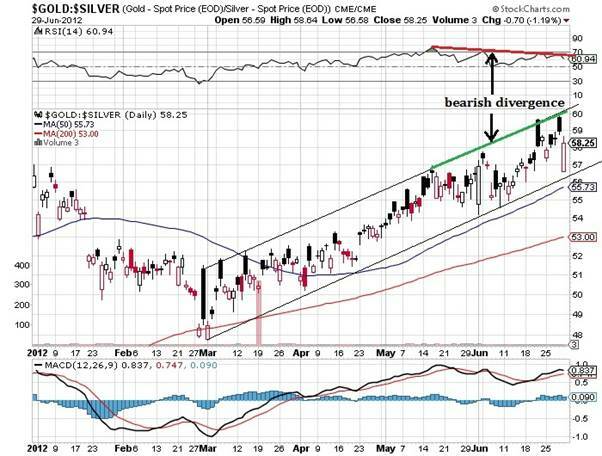 This could be a signal that the ratio will soon fall significantly, confirming higher prices for gold and silver. On the chart, I have indicated a big triangle. When the price moves out of this triangle, it is very likely to fall or rise very fast (a very long way). It really could go either way, and nobody can be 100% certain which way it will go. However, before price makes a big move, there is almost certainly going to be signs and evidence of that big move. Based on the evidence that I have collected, analysing gold and silver, I am convinced that the big move will be higher.